Did you know that buildings are responsible for nearly a quarter of Canada’s carbon pollution? Buildings are also linked to about a third of carbon pollution in the United States and constitute the largest source of emissions in North America. Meanwhile, leading countries, states, provinces, and cities have committed to taking action to avoid the worst impacts of global warming, and adopted targets informed by climate science. When looking at emissions from the building sector, they face a unique challenge: buildings last a long time. Retrofitting buildings is costly and complex, so it is crucial that we construct new buildings to the best standards of energy efficiency as soon as possible. Every building built to suboptimal standards represents a 50-plus year liability in a world that needs to be almost fully decarbonized within the next 30 years. One strategy to reliably reduce emissions from buildings at a low cost, while also improving their durability, comfort, and resilience, is to improve the thermal performance of building enclosures. By increasing the insulation and airtightness of walls, roofs, and windows, it is possible to reduce the energy used for heating buildings by up to 90% compared to common practice. This low-tech, “passive” approach to thermal comfort — in contrast to active approaches that rely on complex mechanical systems — is the cornerstone of the Passive House movement and a strategy used by thousands of green buildings around the world. Once the projects on the books are completed (and if they certify), the number of Passive House units in North America will have increased six-fold, going from 500 in 2015 to over 3,000 units. A quarter of these are in Vancouver alone. North America will then boast nearly 2 million square feet of certified Passive House buildings, three times more than in 2015. The origins of Passive House design date back over 40 years to the Saskatchewan Conservation House built in 1977 in Regina by a team of researchers from the National Research Council and Saskatchewan Research Council. The Saskatchewan Conservation House boasted excellent thermal insulation, an airtight building enclosure, and one of the first heat recovery ventilation systems in the world. Tested 30 years later, the airtightness had not changed significantly, and the walls showed no sign of moisture accumulation. Eventually, the principles of Passive House design were codified and systematized by Bo Adamson and Wolfgang Feist, who founded the Passive House Institute (Passivhaus Institut) in 1996 in Darmstadt, Germany. Buildings adhering to the Passive House standard use dramatically less energy than conventional buildings due to a high level of insulation, high-performance windows with shading that modulate heat loss or gain, an airtight building enclosure, minimized thermal bridges, and continuous ventilation with energy recovery. Certification of Passive House buildings is based on quantitative performance targets and a series of requirements that maximize occupant comfort and health. Passive House Canada (founded in 2013 as Canadian Passive House Institute West) is the national professional association that advocates for the Passive House building performance standard. Passive House Canada is a member of the North American Passive House Network, which also has chapters across the U.S. A leading proponent of passive buildings south of the border is Passive House Institute U.S., established in 2007. PHIUS has its own distinct standard, PHIUS+2015, which features cost and climate-optimized targets. The Passive House standard has also inspired other national codes or programs such as Switzerland’s Minergie and Brussels’ 2015 building code. Canada’s R-2000 certification for high-performance homes pre-dates the Passive House Institute, but it’s also inspired by a passive design approach (though the insulation and airtightness requirements are not as strict). Today, Passive House offers an effective pathway to meeting the “net-zero ready” targets set out in the Pan-Canadian Framework on Clean Growth and Climate Change and B.C. Climate Leadership Plan. In November, the Pembina Institute organized a media tour of The Heights, a six-storey, 85-unit, market-rental apartment project in Vancouver. It aims to be Canada’s largest building certified to the Passive House standard, and it’s expected to use 80% less heating energy than a conventional building, leading to dramatically lower utility bills for tenants. Passive House buildings like this one are more comfortable, healthier, and quieter, and cost less to operate. Demand and offerings for training of professionals and trades in Passive House has increased rapidly. There are currently over 1,600 professionals and trades trained in Passive House construction in North America, with hundreds of new certifications expected in the next year. Clearly, we are at an important inflection point in the development of Passive House markets in North America. The leadership of early adopters is now being followed by integration in established regimes, whether through development by larger scale developers, or integration by subnational governments. All signs point to the rapid growth observed in the last five years being surpassed by Passive House development over the next half decade. 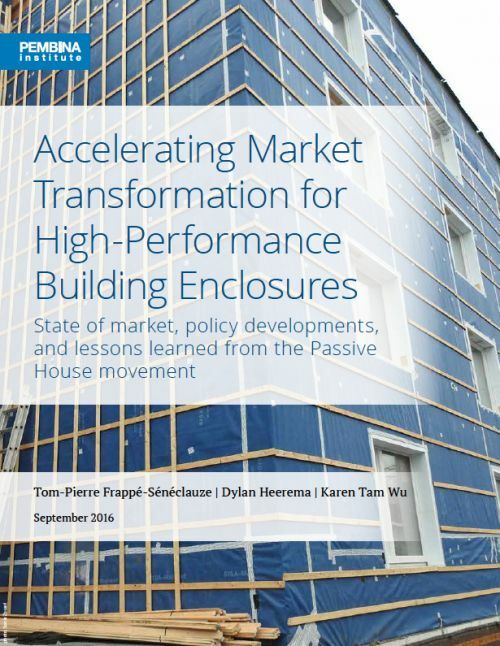 Tom-Pierre Frappé-Sénéclauze, Dylan Heerema, and Karen Tam Wu are the authors of Accelerating Market Transformation for High-Performance Building Enclosures, a report that examines the state of the market, policy developments, and lessons learned from the Passive House movement. They work in the buildings and urban solutions program at the Pembina Institute in Vancouver. This article appeared in the Georgia Straight. The B.C. government’s long-awaited climate plan does not put B.C. on track to meet its legislated targets. However, it does include some promising commitments with respect to the building sector.